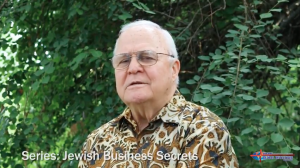 This series has been addressing Jewish business secrets. In our last session we began looking more closely at the legacy of Jews. As this legacy comes into its fullness, we find it is releasing destiny and the restoration of what was promised to Abraham centuries ago. In just this last generation significant keys to this restoration have been emerging. They are the keys to restoring what was promised to Abraham’s descendants. These are the keys to the time Jesus spoke of when a great shift would take place in the world and the model exemplified by Abraham reflecting an economic, trust society with God at the center would come into place.